MIDTOWN — Rising rents have chased Jerry Ohlinger's Movie Material Store up town from Greenwich Village, to Chelsea and to two different Midtown locations since he opened for business in 1976. There used to be seven stores like his, which exclusively sells pictures and posters from movies, in Manhattan when he first opened, Ohlinger said. "We're the only ones left," he said. Ohlinger, 72, credits his survival all these years, despite the cutthroat Manhattan real estate market, on his adaptability. He's been willing to sacrifice foot traffic for a small, second-floor shop at 216 W. 30th St.; he opened an eBay store to cater to customers online; and he moved tons of his inventory to a warehouse in New Jersey. "It's a little less convenient to us, a little less convenient to the customers," he said. "But it's the only way we could stay here." While he says that business is solid, he's asking for help defraying the costs of a big move coming up in early December where he and his staff plan on transporting around 1,700 boxes and 200 filing cabinets filled with posters and photos, mostly by hand from one storage facility to another. Jeremiah's Vanishing New York previously reported Ohlinger's GoFundMe campaign to raise money for the costs of the move. 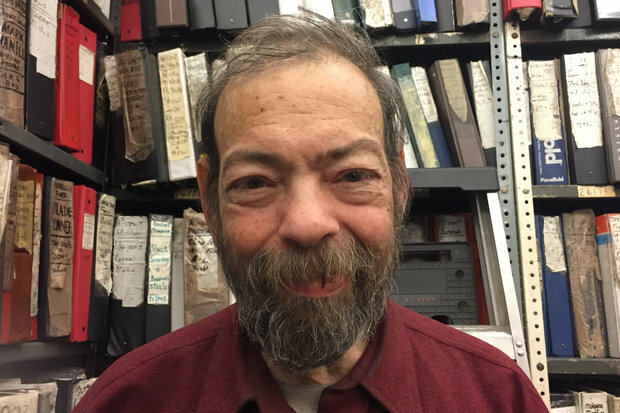 Ohlinger, who lives in the same apartment on West 78th Street apartment where he grew up, has collected pictures of movies since he was 10 year old, he said. When he opened his own shop in 1976 on 120 W. Third St. he already had a hefty collection of his own, he said. Now he says he has around 750,000 photos and posters, most of them in storage, from all kinds of movies from silent pictures to current Hollywood blockbusters. None of the inventory is digitized; it's all cataloged in binders and filing cabinets by actor or for sci-fi and fantasy flicks, by movie, he said. "The employees know everything, I know the rest," he said, paraphrasing Mark Twain. Photographs usually run around $9 while posters from newer movies are around $25. Vintage photos can command up to $150 while coveted posters occasionally earn thousands. Still, those sales are relatively rare, and when their landlord on West 35th Street in 2005 wanted to nearly double the rent, Ohlingher knew he had to find a new space. He currently pays just $5,500 for the second floor shop on West 30th Street. "This kind of business can't pay $14,000 for a retail space," he said. "It's just not possible."